Just because it is true it does not guarantee that this will become broadcast ‘news’. It will more likely become broadcast NEWS if there is VISION – video or photos. The sooner the information can be sent – same day is preferable – the better the chance for broadcast. The stronger the theme (demonstrations, police arrests/brutality, interviews with key people etc) the better the chance for broadcast. Information about the event needs to be attached: who, what, when, where, why. Verifiable facts are very important. Different sources are important. Prepare: have people designated on the ground who have prepared beforehand to film the event and quickly and securely transfer the film – to the computer, to beyond Papua via the internet using Dropbox (for large files), facebook, email. (Make copies and store them in a secure place). (Details for Dropbox: https://www.dropbox.com). All releases and provision of information need to have contact details of some source or fixer, so journalists can follow up and ask more questions. This person needs to be able to give a quick report of FACTS not opinion, unless asked directly for their opinion. Preferably with a good command of English for international media, though this not essential. Witness statements, interviews, reports, and visual evidence after an event has happened are all very valuable pieces of content for any journalist. 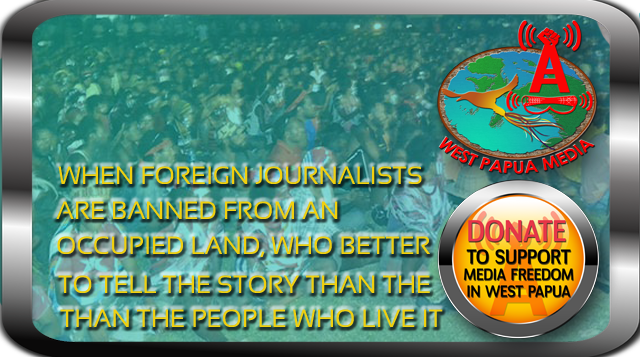 I would like to thank and encourage West Papua Media Alerts for the brilliant work and advice they are giving throughout the internet. It s incredibly refreshing to hear any news from West Papua at all. I hope very dearly that with the help of this Website, we can put an end to the genocide in West Papua and help it on the path to Freedom. Thanks Harry, much appreciated…. however, like anything, it does not have an impact until others are involved – it is the spreading of the word that makes the difference.